Sargassum muticum is an invasive brown seaweed that has recently found its way to the shores of Ireland. 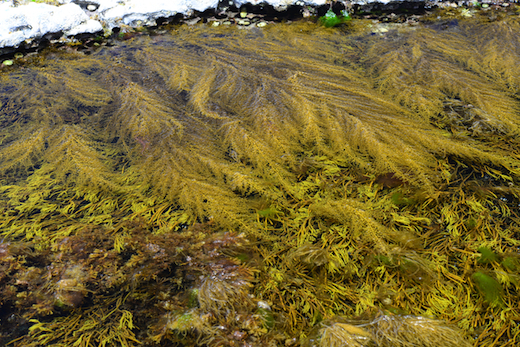 In Japanese waters, where it originates, it is a relatively small, innocuous seaweed (1-2 m in length). However, outside its original range it is found to be highly invasive, and it has been reported to reach 10 m, although most mature plants are 2-3 m in length. It is now widespread. It has now spread to virtually all coastal areas in the S, SE, SW, W and NE of Ireland. In the picture above from the Burren in Co. Clare, Ireland, it is clearly competing with the rare Lusitanian species Bifurcaria bifurcata in mid-shore pools that also harbour the Purple Sea Urchin Paracentrotus lividus, another Luisitanian species. How did it get to Ireland? 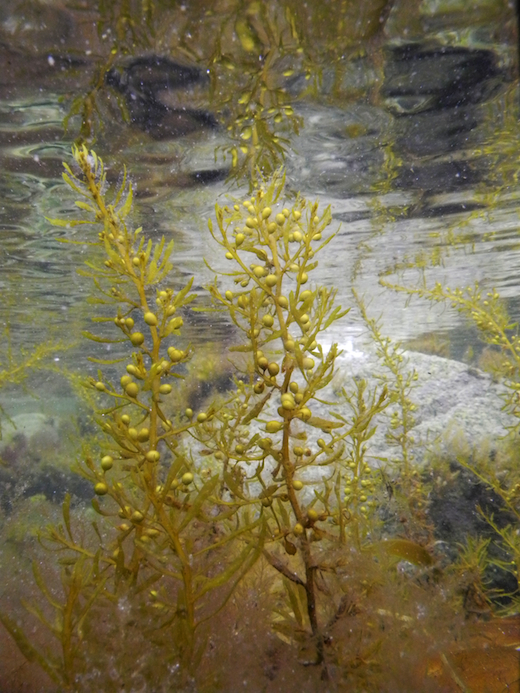 Sargassum muticum was first found and identified in Europe in 1973 by Bill Farnham at Bembridge Ledges in the Isle of Wight, U.K., at which time plants were about two years of age. Examination of material in herbaria indicated that it may have arrived on the north coast of France as early as 1966. Since then it has spread to most coastal countries in Europe, from Norway to Italy. In 1995, it was discovered in Strangford Lough, Co. Down, Northern Ireland, suspiciously near an oyster farm. This was the only known location in Ireland until September 2001, when it was found at Cashel Bay, Co. Galway by Ciarán Loughnane. The transplantation of oyster seed from infected regions of Europe and the transportation of fertile fronds by currents or by boats or ships are believed to be the most likely sources of inoculation to new areas. 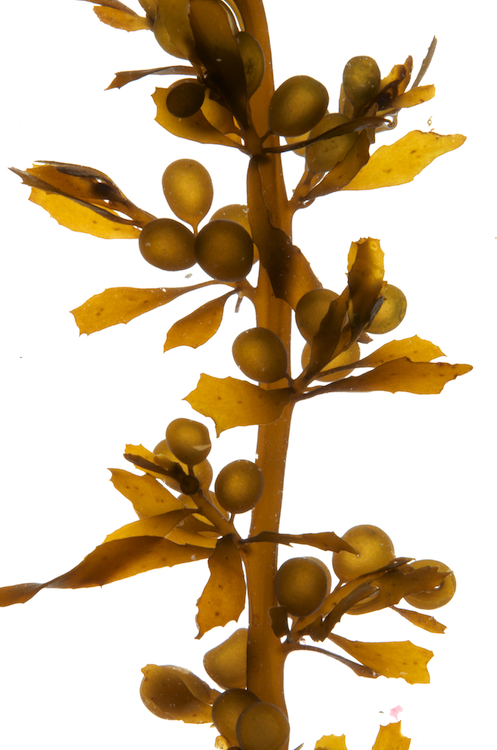 Sargassum muticum is usually 1-3 m in length, but can grow up to an incredible 16 m in length in certain habitats, notably in Normandy and Brittany, and can form floating mats on the sea surface. It can grow at up to 10 cm each day, and it also has a relatively long life-span of 3-4 years. It reproduces both sexually and via floating fragments. Fertilisation usually takes place on the surfaces of the reproductive bodies (receptacles) and thousands of "germlings" are released. These settle rapidly, usually near the parent alga. Dense mats of Sargassum can form very quickly. Fronds, if detached, can continue to shed germlings as they drift, making for a very powerful dispersal mechanism. The loss of an entire frond is not fatal to the weed, as a new frond can grow from the primary axis that remains, often buried in sand or detritus. The alga has two distinct parts: the perennial, dark brown basal axes, and the lighter coloured annual primary laterals. The latter are shed or torn off in late summer. During the summer months, the number of small round vesicles (air bladders, below and click on picture for a close-up) increases. Receptacles are most abundant in early autumn, just prior to the shedding of annual primary laterals. Because of its strongly seasonal growth pattern, Sargassum muticum may be most conspicuous on the shore during the summer months. Sargassum is highly tolerant to environmental parameters such as desiccation, full sunlight and variations in salinity and temperature. This enables it to occupy a broad range of habitats from the upper intertidal (mainly rock pools) to the subtidal and substrata from exposed rock to Zostera marina (Eel-grass) beds. What problems are associated with it? In the European countries where it has already become established, there are several effects reported to be associated with this weed. Its growth on the surface of the water can impede boat traffic and swimmers; it can also cut down light penetration to underwater communities. The reduction in light and space on the sea floor may lead to localised reduction in native species such as Saccharina latissima (formerly Laminaria saccharina; sugar kelp), Himanthalia elongata (thongweed), and Zostera marina. Large mats of weed that break off in late summer can accumulate on the shore to form dense clumps of slowly rotting weed. However, Sargassum can also populate areas of sparse algal development, thereby providing additional habitats for marine life, such as small fish and crustaceans. Unfortunately, Sargassum muticum is now widespread and common on all Irish shores, and there is nothing that can be done. We can only hope that, in time, it will become less invasive and agressive, as seems to have happened on other coasts to which it has been introduced. In 2018, Galway Bay populations in the upper intertidal seemed to be less vigorous than they had been when first introduced. Site © M.D. Guiry 2000 - 2019. Important copyright notice: all text, design and photographs on this site are copyrighted by M.D. Guiry unless otherwise stated and all rights are strictly reserved. Click here for copyright information and contact. Website design: 249 Design Studio. Site maintained by M.D. Guiry (michael.guiry@nuigalway.ie). There have been 8724694 page loads since 1 January 2014 on 22 April 2019.